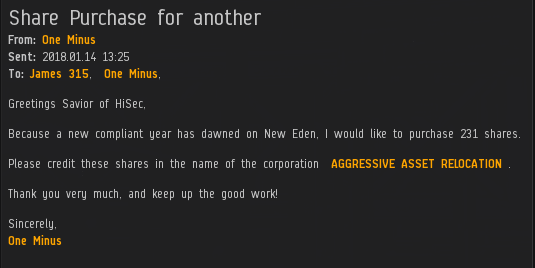 You can't always be in EVE, but you can always keep your presence felt in EVE by contributing to the New Order of Highsec. Our Agents are everywhere in highsec at all times. 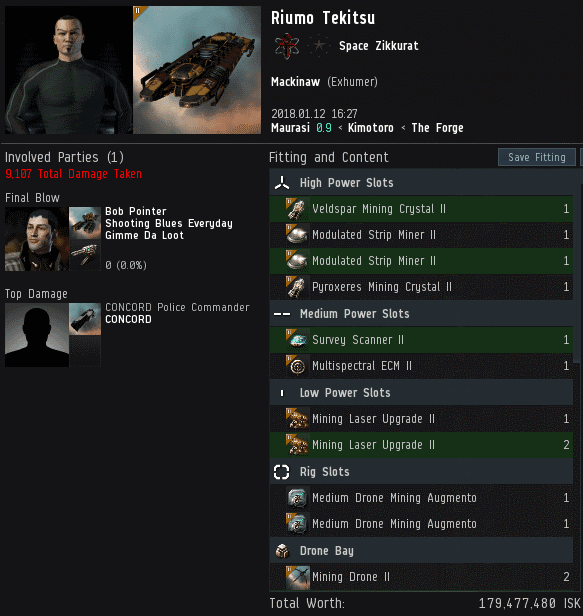 Reid Hershel purchased 315 shares, which took us past the 1,571 billion isk mark and earned him a Supreme Protector's Tip of the Hat™. Another responsible corporation, yes, but there's more to the story here. This purchase of 231 shares would've been exactly enough to earn a Supreme Protector's Tip of the Hat™--key word, "would've"--if not for Reid getting there first. Timing is everything in the game of Supreme Protector's Tips of the Hat™. 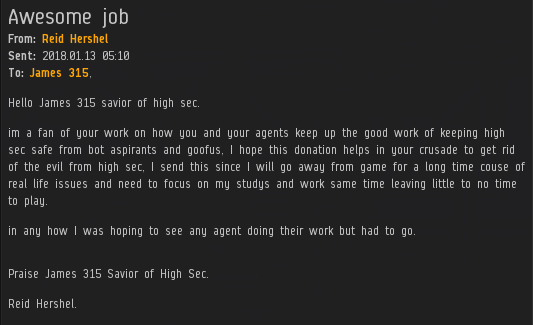 I received the 50 million isk biscuits and credited this shareholder with additional stock. We also accept Bitcoin. (As with isk biscuits, it's one million per share). I think we have time to take some questions. I'll take the second part first for some reason. Look through some MinerBumping posts and you'll see a template in someone's bio. As for the shares, you are correct--they're virtual virtual. The New Order's stock program transcends the EVE game mechanics, with their fiat shares and CCP middlemen. Have you ever wondered how kill rights work? Carebears are always using them incorrectly, so I thought I'd let an Agent demonstrate how it's done. Riumo Tekitsu was excited when he saw Agent Bob Pointer hanging around in a Venture. There was a kill right available on Bob, so Riumo went on the attack with his drones (so much for Mackinaws being ships that can't shoot back!). However, Riumo completely forgot to actually activate the kill right. 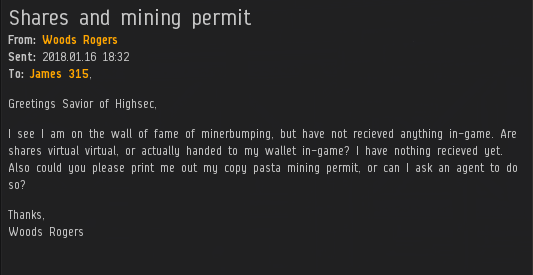 So the miner got himself CONCORDed. Now, because of the foiled gank attempt on Bob, Bob had a kill right on Riumo. A few days later, Riumo was AFK mining in the same system. Bob activated the kill right (such an important step!) and killed the miner. Remember when the carebears thought kill rights would put an end to bumping and/or ganking? Remember how the safety button was supposed to protect carebears from CONCORDing themselves? There's no substitute for the wisdom of the Code. Well done, Agent Eva Mavas. 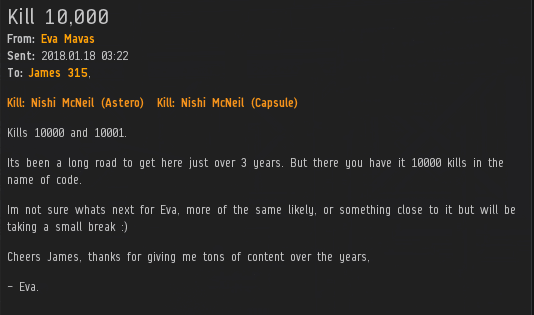 As I've said before, the Code has been responsible for creating far more content in EVE over the past several years than all of the CCP devs combined. 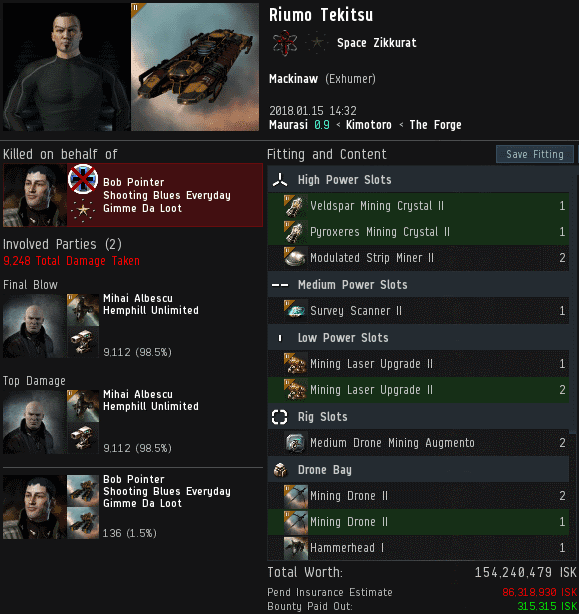 Granted, there aren't as many CCP devs as there used to be, but it's still really impressive. We have miners taking aggressive action in Mackinaws but at the same time they are saying the Code attacks defenseless ships. What gives? Wow just wow. Antigankers are failing INCREDIBLY hard right now.